Does quality, reliability or speed matter? We maintain high standard of manufacturing and quality assurance process which ensures quality memory products. Our memory products comes with minimum 5 years of warranty. Highest standard of quality assurance ensures reliable memory product. Our memory cards are X-Ray proof (Airport X-Ray), Shockproof, Magnet Proof, and Temperature proof. It can be operated between between 0°C to 70°C temperature. Storage temperature is between -25°C to 85°C. We believe in innovation and invest on latest technology. Our latest Ultra Fast series memory products are manufactured based on latest industry standard. 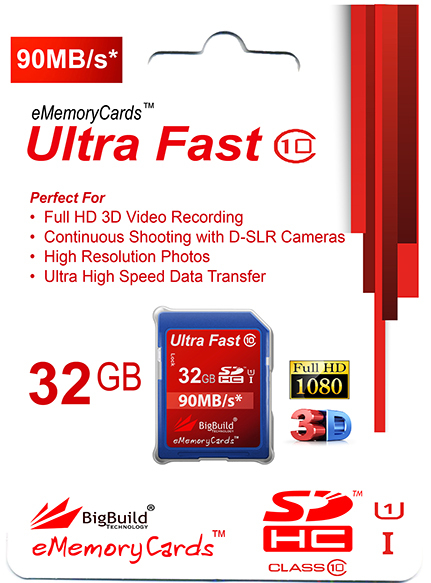 Our new 32GB Ultra Fast 90MB/s UHC-I Class 10 memory card has just been released in UK market. BigBuild Technology's 32GB Ultra Fast 90MB/s Class 10 memory card is one of the fastest memory card available at an affordable price. This memory card is perfect solution for storing high resolution photos and recording full HD (1080p) videos. Faster memory card ensures flicker free smooth HD video recording and continuous shooting feature of high end D-SLR cameras. eMemoryCards™ SD card is a UK Brand. It comes with 5 years manufacturer warranty. This Memory card is built with best chips & high end controller for best compatibility and speed. That's why BigBuild eMemoryCards are compatibility with many devices around your home. The minimum guaranteed speed is 18MB/s for for read and write operations. Website Design © eMemoryCards Big Build Technology Ltd. All rights reserved.